Jon Merrill realizes the mind is a terrible thing to waste. It's especially true on the ice, where he's made a living out-thinking his opponents as a top-two defenseman for the U.S. National Team Developmental Program's Under-18 team in Ann Arbor, Mich.
"I'm not the strongest or the fastest player and I don't have the heaviest shot, so when I play the game, I have to out-think my opponent because I can't out-skill or throw guys into the boards," Merrill told NHL.com. "I look at a player like Nicklas Lidstrom -- I really enjoy watching the way he does it. He just controls the whole game back there just by thinking the game. That's how I want to be and I think I've done a pretty good job so far." NHL Central Scouting had the Brighton, Mich., native rated 20th among North American skaters (No. 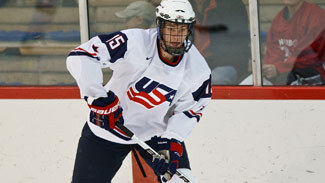 6 among defensemen) on its midterm list of the best talent available for the 2010 Entry Draft. "He's very intelligent on both sides of the puck, makes good decisions, and defensively is good about keeping himself in good position," USNTDP U-18 coach Kurt Kleinendorst said. "There are a lot of things to appreciate about his game, including his size (6-foot-3 1/4, 198 pounds) and his dedication in the weight room." Like any other aspiring skater on the board, Merrill was pleased with his ranking. "I think it's a great honor; I guess I was kind of expecting it because I don't think my play has suffered at all," Merrill said. Merrill was born in Oklahoma City, but moved to Michigan, where he picked up the game as a 5-year-old. It was around that time he began tagging along with his older brother, Greg, now a defenseman for the Bay State Breakers of the Eastern Junior Hockey League. "Greg is a definite role model," Jon said. "He's a real hard competitor. When people tell me I don't play hard enough or am not competitive enough, he's there to back me up. He's such a worker and I respect and admire that in him." The U.S. Under-18 Team won four of five games to finish second at February's Six Nations Cup in Minsk, Belarus. Matthew Nieto had a hat trick and an assist to lead the United States to a 5-2 victory against the Czech Republic in the final game of the tournament, Feb. 14, to help Team USA finish 4-1. The team's only loss was a 2-1 setback to unbeaten Russia one day earlier. Also playing in the tournament were Finland, Belarus and Sweden. "Not what we were looking for with regard to our finish but it was a great exercise that should prepare us for April," U-18 coach Kurt Kleinendorst said. The U.S. team will return to Belarus April 13-23 for the World Under-18 Championship, which will be held in Minsk and Bobruisk. "There's no substitute for experience like the experience itself," Kleinendorst said. "We had a chance to get a feel for what the travel will be like, get an idea of the living conditions, the food, accommodations and the overall culture of Belarus." Kleinendorst said five members of his team contracted food poisoning following their tournament-opening 5-2 victory against Finland. Still, he was disappointed his team didn't exhibit a little more grit against the Russians. "There are no excuses -- we have to be tougher mentally and physically," Kleinendorst said. "We are trying to do what no U.S. team has ever done -- win gold in an Eastern Bloc country. It won't be easy. The Russians are very good and may be the early favorite. I really liked their team and the way they played." Four members of the U.S. Under-18 Team are ranked among the top 30 draft-eligible North American skaters on Central Scouting's midterm rankings -- Derek Forbort (No. 11), Jonathon Merrill (20), Stephen Johns (28) and Billy Arnold (30). 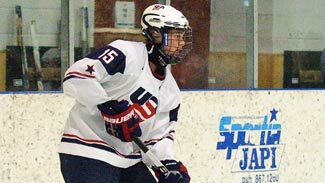 Merrill, who will attend the University of Michigan in the fall, played a role in the U.S. national team's gold medal-winning performance at the 2009 World Under-18 Championships. He also paced the U.S. defense corps with 3 points during the club's three-game sweep to the '09 Four Nations Cup title, and chipped in with 3 points during Team USA's second-place showing at the 2010 Six Nations Cup in Belarus in February. Having the opportunity to play 19 games with the U-18 team last season got Merrill into the proper frame of mind entering his first full season with the club in 2009-10. "It was awesome, especially winning that (World U-18) gold medal," he said. Attending Michigan long has been a dream of his, especially playing in front of a sold-out Yost Arena. "The atmosphere in that place is unbelievable and I can't wait to get there and play for coach Red Berenson," Merrill said. "I'm just hoping to make an impact." While there has been discussion of his needing to improve his overall speed, Merrill doesn't foresee any issues down the road. "I don't think it'll be a big thing," he said. "It's something I'm working on every day." "He's not a poor skater, but he's just not at that high level with getting to that gap, but once he does, he'll completely bring his game full-circle," Kleinendorst said. "He's only 18, so it's not like he's a seasoned pro yet." But he's slowly getting there, particularly in the USNTDP's games in the United States Hockey League, where he's learning against many of the nation's finest 19- and 20-year-old skaters. "He plays the game a lot like Jordan Leopold," said Central Scouting's Jack Barzee, who specializes in U.S. prospects. "He plays weaving and diving, sneaking and thinking, gaining the zone and moving the puck ahead and right on the tape to a guy. He's skilled and he's really come a long way in his development." That continued development could lead to him rising in the rankings when Central Scouting releases its final list in April. "I can tell the way our reports are coming in now that our final meeting will be a dandy," Barzee said. "I don't think where we have him will play any significant role on where he gets drafted; it'll depend on the teams that are in the immediate hunt for a defenseman like him and how many picks they have. Right now, I'd say he'd probably go anywhere from 14 to 24 in the draft."